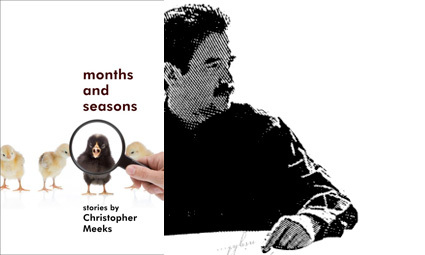 I started reading the short stories in Christopher Meeks’s Months and Seasons on a recent plane ride, and was struck by his quiet sense of humor—he’s not a guy who works for laughs, necessarily, but when his characters get to bickering with one another, little spikes emerge from their interactions. In this essay, he explains how he learned to let that part of his writing voice flourish thanks to the example set by one of our greatest contemporary short story authors. Like many people of my generation, I wanted to write great stories, important stories—stories that made me rich. Then along came reality: I receive little or no money when my stories are published, but I get two copies of any literary journal I’m in. While that hasn’t helped pay my son’s college bills, I’ve nonetheless been awed that I’ve made it into the journals. Also, publication has helped me rediscover my sense of humor. When I started, great stories, of course, had to be serious. Woody Allen has had this complex, too, which is why he made Interiors and Cassandra’s Dream. He’s wanted to be Begmanesque—as others have been desperately trying to mimic his funny movies and be Allenesque.